Subramaniyan Karuppaiya (born 25 May 1939), known by his stage name Goundamani, is an Indian film actor and comedian. He is known for his comic duo partnership in Tamil films with fellow actor Senthil. 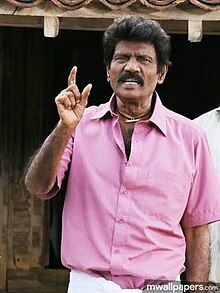 Eventually he was called as Goundamani for his ability to give counter dialogues on the spot and off the script (as a warning to his co artiste to be prepared) on stage and during shooting as per K. Bhagyaraj who was writing scripts and title credits for P. Bharathiraja in his early days during the movie 16 Vayathinile (1977). So far, he has acted over 310 films. Kavundamani was born as Subramaniyan in Vallakundapuram, a village near Udumalaipettai Coimbatore, Tamil Nadu, India. His father is Karuppaiya and mother Annammal. He is married to Shanthi and has 2 children. ^ Palaniappan, P. "Comedian Kavundamani's wedding photo – A Rare Picture!". SouthDreamz. Retrieved 16 December 2013. ^ "Comedian Kavundamani's Daughter Wedding". Indiaglitz.com. Retrieved 16 December 2013. ^ "Kavundamani is back as Hero with 49 O". Indiaglitz.com. Retrieved 16 December 2013. ^ Lakshmi, Venketeswaran (16 December 2013). "Goundamani starts shooting for 49-O". The Times of India. Retrieved 16 December 2013. This page was last edited on 16 April 2019, at 22:44 (UTC).